I usually keep a can of crescent rolls around in case I ever need to go MacGyver on something. There have been many evenings when Husband and I have wanted something sweet and those crescents have become cinnamon apple swirls or chocolate chip turnovers. And sometimes I use them with hot dogs to make a bigger version of Pigs-in-a-Blanket. 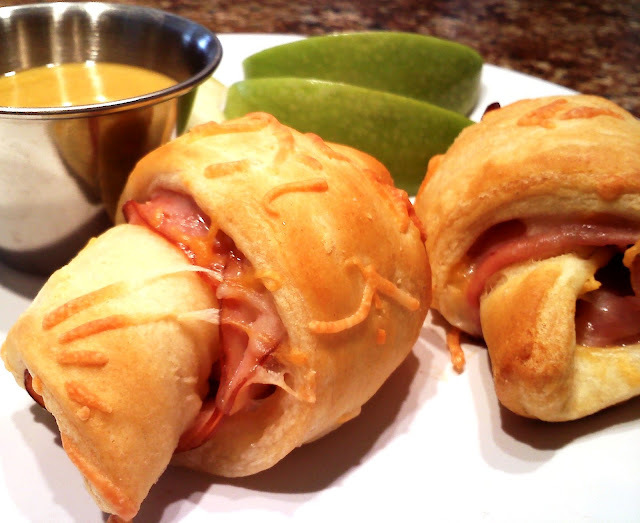 I've never blogged about any of these because most folks can manage stuff like that on their own but when I made these Ham & Cheddar Roll-Ups yesterday I decided to dress them up with a dipping sauce and that is what really knocked my socks off. I wanted a cross between honey mustard and honey butter so I just mixed equal parts butter, honey and mustard and viola, it was exactly what I was looking for. It’s sweet and tangy and creamy all at the same time. Holla! I think I’m going to keep these in mind for appetizers. You can use the mini-crescents and make smaller roll-ups and serve them on a platter with a bowl of the dipping sauce. Line a baking sheet with aluminum foil and lightly spray with cooking spray. To assemble roll-ups, separate dough triangles from the can of crescent rolls. Sprinkle cheddar cheese on each triangle. Folding ham slices to fit, arrange 3 slices of ham on each triangle. Starting at the wide end, roll triangles and place each roll-up on the cooking sheet with the end point of the dough tucked under the roll-up to prevent it from opening up during cooking (see picture below). Bake at 375 degrees for 11-12 minutes. To prepare dipping sauce, whisk together honey, butter and mustard in a microwave safe bowl. Mixture will likely be grainy. Microwave for 20 seconds and whisk until smooth. You may have to microwave for an additional 20 seconds if the mixture doesn't whisk together smoothly. *With this and all of my recipes, real (salted) butter is used. Oh my, these look scrumptious! These would be great for lunch with the kiddos too. Can't wait to try them. My grandkids love ham and cheese so this will be a new way to try for them. Thanks. I am going to make these for my kids for lunch tomorrow! So fun! I am a HUGE crescent roll fan, I use them in anything I can and have already shared several of those creations on my blog. I also LOVE honey mustard so I will definitely be trying these! i've not heard of Crescent rolls in England - can you explain what they are and suggest how i might make my own because these look delish! In a Kitchenaid mixing bowl, stir in warm water and nonfat dry milk powder until it dissolves. Add yeast, then sugar, salt, butter, egg, and 2 cups of flour. Mix on low speed until ingredients are wet, then 2 minutes at medium speed. Add 1/2 cup flour again, mixing on low speed until wet, then 2 minutes at medium speed. You can add an additional 1/2 c if your dough is still too wet but I usually stop at 4 1/2 cups of flour total. Dough should be soft, not overly sticky, and not stiff. Scrape the dough off the sides of the bowl and pour about 1 tablespoon of vegetable oil around the sides of the bowl so that the bowl is coated. Spray some plastic wrap with non-stick coating and place the plastic over the bowl. Allow it to rise in a warm place until the dough doubles in size and rises to the top of the bowl. 9. Once the dough has risen, place your dough on a flat floured surface, then divide the dough in half. 10. Roll out 1/2 the dough into a circle. 11. Using a pizza cutter, cut the dough into 16 even slices. 12. Begin to roll the slice of dough in, starting from the wide end and tuck the small point underneath. 13. Place rolls on parchment-lined baking sheet. 14. Repeat steps 10-13 for the 2nd half of the dough and let them rise for 1- 1 1/2 hours, until double in size. 15. Bake at 375 F for 15-20 minutes or until golden-brown. 16. Brush with melted butter while hot. When you say, “…because most folks can manage stuff like that on their own…,” don’t kid yourself. You’d be amazed at how many people get stumped by the simplest of dishes. Even some of us old pros need to have the gray matter, or what’s left of it, jarred from time to time. BTW, ever thought about deep frying these? I use either a sharp cheddar or a pepper-jack, then throw them in the fry-O-Lator; and serve them with a honey-mustard aioli. I know, I’m evil and need to go to Confession.